Pink Sings. Pink sings sweetness. Pinks sings wonder and whimsy. Pink is the song of little girls. Pink makes you think of sugar n’ spice, of ruffles and of bows. 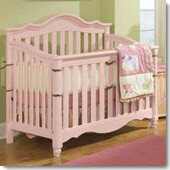 A pink baby crib is the only choice for your darling new baby girl.